Caution: this is a LONG product review of two different rotary blade sharpeners but I wanted to give y'all the full description. I purchased both of these items on my own; neither manufacturer offered me anything to review and in fact, they have no idea that I even bought their units! So, this is *my* experience and I wanted to share it with you. Like every other quilting these days, I have an inventory of rotary cutters. I have the original 28mm (excellent for zipping around small curves), the 45mm and the 60mm blades. I've more or less settled on exclusively using the 60mm because you can cut so much faster (or so it seems to me) than with the small blade. I try to be VERY careful and not run over pins or other obstructions but just the other day, doggone it! a pin was hiding from me and, sure enough, I nicked my blade. I was really, really, REALLY annoyed because I had only recently replaced that 60mm blade. That size is *expensive*. Ouch. Being the stubborn person that I am, I was NOT going to replace that blade for one silly, annoying nick. So, I carried on. Every time I was cutting a length of fabric, that little nick would cause ONE LOUSY THREAD not to be cut. That meant I needed to either snip that one lousy thread with scissors or run the rotary cutter again. Sigh. Well, after being annoyed once too often regarding that one lousy uncut thread, I decided it was time for me to *invest* in a tool .. a sharpener that would allow me to use my blades just a little longer. I did some basic research .. not any great depth or nit-picking .. but I looked at a few, read the reviews and the one that caught my eye was the "TrueSharp Power Rotary Blade Sharpener". It looked like it was quite well throught out. It was electric, would sharpen *all* my blades .. the 28mm, 45mm and 60mm .. so it was versatile. It had a hinged lid that would exert the same amount of pressure every time, so there would be no guess work as to how hard should I be pressing down. So I thought. The thing to remember is .. the blade was basically 99% good. It cut wonderfully, other than that annoying little nick. I followed directions explicitly. It said that you might need to sharpen a blade a couple of go-rounds the first time .. fair enough. I ran the blade through the sharpener for the specified amount of time. Then I ran the newly sharpened blade over a piece of quilting cotton .. which is normally what I'm cutting. HOLY MOLEY, the blade was AWFUL. The blade actually cut WORSE than when I started. I was shocked .. really dumbfounded. OK ... they had addressed this possibility by saying you might need to do the first sharpening a couple of times. So, I did. And each successive "sharpening" made the blade worse and worse. I ended up with a completely DULL blade, whereas I had a mostly sharp blade to begin with! Conclusion: Do NOT NOT NOT buy the "TrueSharp Power Rotary Blade Sharpener". It is a worthless piece of machinery that not only does NOT work as advertised but actually leaves you worse off than when you started. Fortunately, I was able to return it and get a refund. But .. that left me in the same position I was before .. if and when (because you KNOW there is going to be a next time) I nick a blade again, I still won't have a sharpener. By now I was determined to have one. The next sharpener on my list was the "Dual Rotary Blade Sharpener" by Colonial. Now the downside is that this unit is a manual one ... when you put the blade in the unit, you must manually twist it against the sandpaper 10-20 revolutions. If you have hand/wrist mobility issues, this could be a problem. The other downside is that it is made for a specific size blade; the unit you buy for your 60mm can't be used for the 45mm and vice versa. BUT, I really did want a sharpener, so I ordered it. When it arrived, I decided to use the ruined 60mm blade as a test. Honest to goodness, it couldn't be made any worse than it already was. Once again, the directions did explicitly say that nicks might not be able to be corrected. Oh dear .. what *is* it about nicks? Well, nothing ventured, nothing gained. I put the dull blade in the unit and twisted it manually 20 revolutions on the sand paper. When I tested the blade on a piece of quilting cotton ... HOLY MOLEY! It was sharp again! Not completely sharp, but realize that the other sharpener had made it completely *dull*. So, I repeated the sharpening procedure once again ... 20 revolutions .. and cut another piece of fabric. HOLY MOLEY!! I had a completely SHARP blade again .. and the nick was gone! Conclusion: I enthusiastically recommend Colonial's "Dual Rotary Blade Sharpener" unit. It does exactly what it says it will do. BE SURE TO GET THE SIZE FOR YOUR BLADE!! Look around and you'll see different price ranges. Do take into account that a lower base price might not include postage, so beware. It also looks as though Dritz makes a similar unit, although I did not buy the Dritz and have not used it. I hope this is helpful to anyone who is looking at buying a rotary blade sharpener. 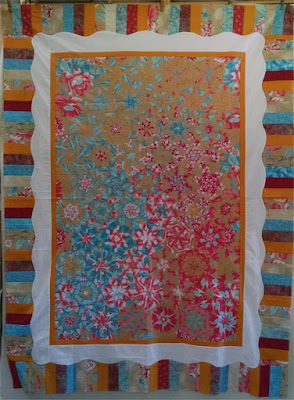 Every year, I attend a quilting Retreat in Phoenix to meet up with my online Delphi forum quilting buddies. Our hotel is just across the intersection from the shopping center where the 3 Dudes Quilting shop is. The Dudes are always very nice and devote one evening of a demo or something just for us. 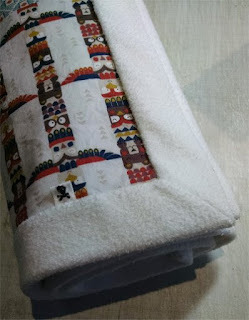 In 2011, Ray showed us his newest (at that time) pattern, which he called Majestic Mountains. The pattern calls for sewing strip sets from jelly rolls but for our demo, he wanted to show us the shortcut .. using striped fabric instead of making a strip set. We got a sheet of instructions. In our Retreat goodie bag, we had received a gift card to the Dudes and it was burning a hole in my pocket. So, I looked around for some striped fabric. (Realize that this was back in *2011* and this being 2016, my thought process at that time isn't all that distinct). I found two striped fabrics and bought enough to make the pattern. 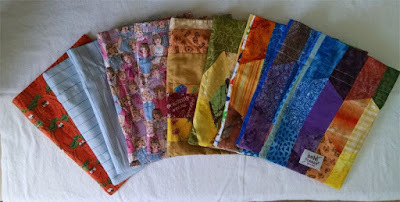 Upon my return home, I prompted put the pattern and striped fabric away. It emerged just now (June 2016). In comparing the pattern photo and the striped fabric that I bought, I was thinking that perhaps the striped fabrics were just a little too similar to offer a nice contrast to each other .. but it is what I had bought and I certainly didn't have another use for them ... so I simply made up the pattern. I'm not *thrilled* with it but that could be because of the striped fabric I chose. It certainly was an easy enough pattern to construct. 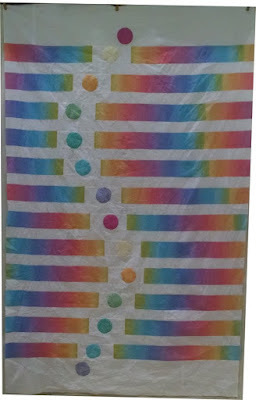 This pattern features using ombre/gradient fabric. It's a striking modern/contemporary design that caught my eye not only for the unusual layout but the use of gradient fabrics. I have a nice stash of that kind of fabric simply because the color changes were so pretty! I had no idea HOW I was going to use them when I bought them, but this is the pattern for sure! 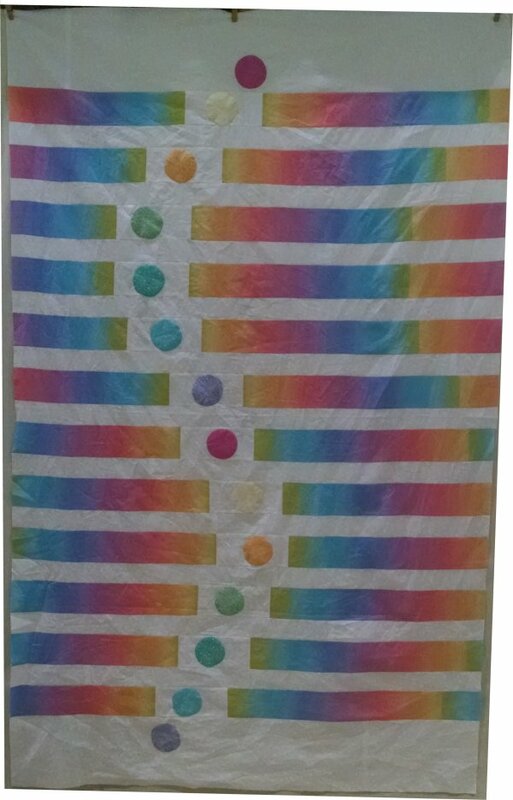 This pattern *used to be* a free download from Blank Quilting. However, it's not there any longer. Neither is it available at the designer's site. BUT ... due to sheer, doggone persistence, I *found* an archive site where it *is* still available. Soooooo ... if you like this pattern, I strongly suggest you download it from the archive site NOW and just file it away for future use. The archive is here. What I really liked the most about this pattern is the optical illusion of the way the stripes flow from one edge back around to the other edge. I'm going to do a faux trapunto behind the circles, to give them a little bit extra dimension. 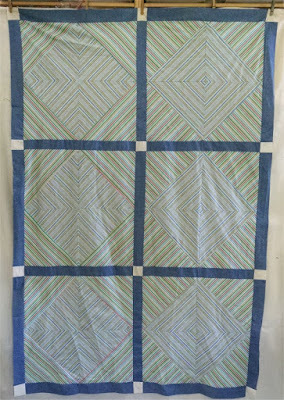 The progress of this quilt was previously blogged about but now the top is done. I had made all the hexagons that I possibly could from the fabric that I had but when I sewed them all together, there were quite a few "void" areas ... I couldn't create a rectangular interior but needed to have one. From another online quilter, I read where, in a similar situation, she simply appliqued the base fabric onto the hexagons until she *did* have a rectangle. Because the base fabric is such a large scale floral print, unless you looked VERY closely at the edges (of the interior rectangle), you'd never, ever be aware that the entire thing wasn't made of hexagons. After the yellow stop border, I put a white, wavy resting border and *then* the piano key border. That white wavy border is constructed in a VERY sneaky way! I didn't think of it, but saw it demonstrated in a Fons & Porter You-Tube video. 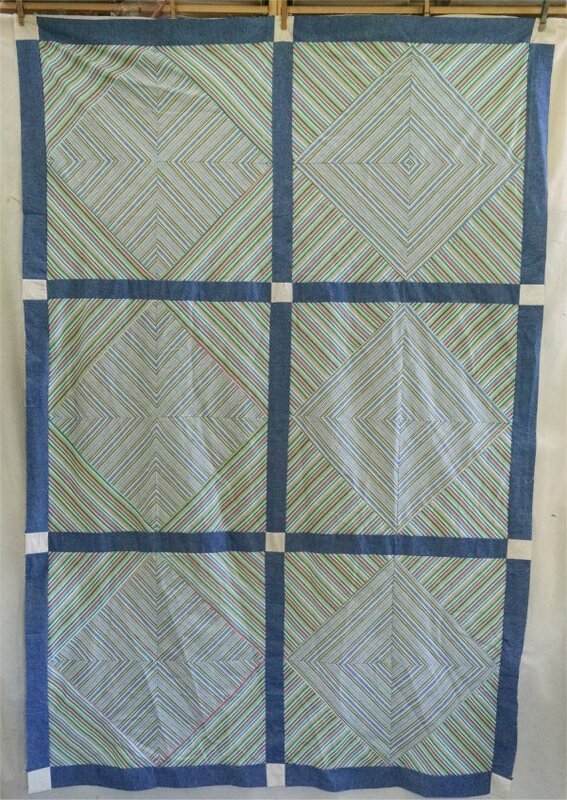 What you do is to sew a plain, standard (in this case, white) border next to that inner yellow border. The edges of this border *will be straight* at this point. You create/draw the wavy edge on a long strip of paper and trace that wave onto the outer edge of the white fabric. I have enough of the yellow fabric to make the binding from it, so it will match the inner yellow stop border. Mr. Pirate & I recently took a 2+ week road trip with our new-to-us small travel trailer up to the Pacific Northwest and even further north, into British Columbia. One quilt shop that we visited was The Cloth Shop on Granville Island in Vancouver. The shop itself is tiny-tiny but has just a whole lot of interesting things to see. I was looking specifically for some fabric that would remind me of this part of our trip. I had already purchased a Canadian Maple Leaf design, so I didn't want that. 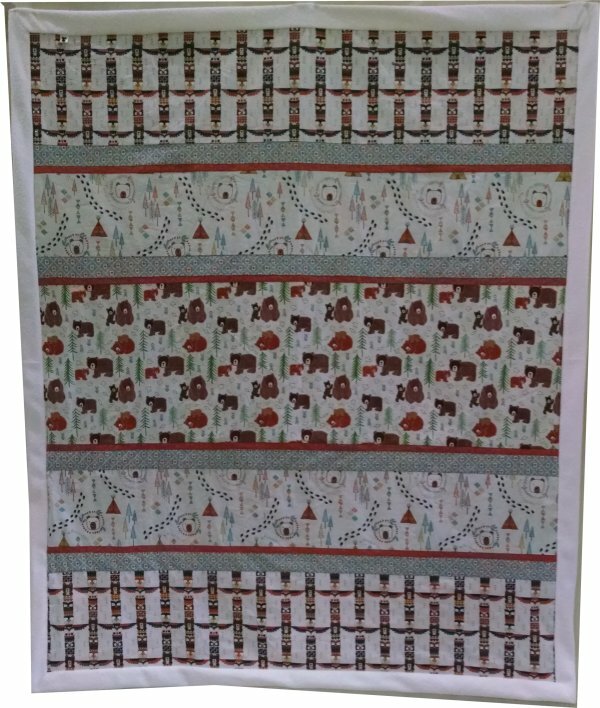 What I did find was a pre-packaged set of coordinated fabrics ("North") and a "pattern" to make a horizontal strip quilt. 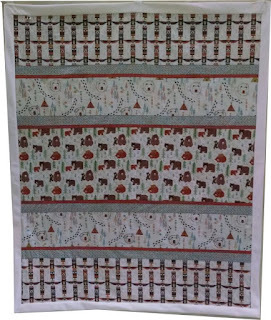 These fabrics were reminiscent of the Canadian northwest and their indigenous peoples. I also found the most AMAZING "fleece" fabric. It's polyester on a knit backing, so it's not going to ravel and is the most luxurious, soft and cuddly fleecy stuff on the front. Not quite like Minky or Cuddle but similar. I bought enough to be the backing of a personal sized throw. Say what? What is this? Well, Beads of Courage is an organization that gives "milestone" beads for kids undergoing cancer treatments. It's tough enough when you are a child to have such a terrible disease and every little thing that can distract them or make them smile is welcomed. The milestone beads are threaded together to make a necklace. Sadly, some kids acquire a LOT of beads and their necklaces are very, very, very long. The kids need a place to store their necklaces and/or loose beads and that where the bags come in. Beads of Courage has directions available to make bags in two sizes. They are simple-simple to make, even beginning sewers can make them. While the samples I've seen show bags made from a single piece of fabric, I used up orphan blocks, strips and pieces to make the bags .. making sure that the bags fit within the stated size criteria. Sharp eyes will notice that the bag on the far right has a woven label on it. These are specific labels that Beads of Courage will mail to you .. these are their own labels. There is no cost to you for getting the labels and each bag needs to have one of these labels on it. and this is how they look when the drawstring is gathered up. 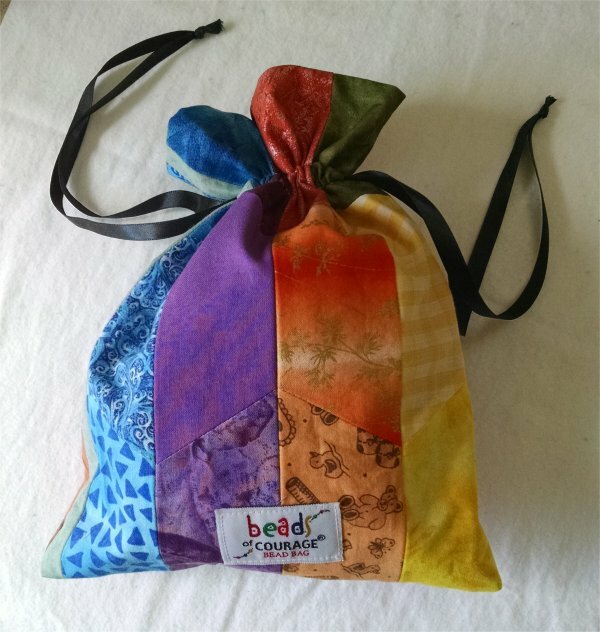 If any of you would like to make a small difference in the life of a child undergoing cancer treatment, please consider making some bead bags for them. They are quick, easy and very gratifying.